1. Preheat the oven to 200°C, gas mark 6. Place the soya beans and pak choi in a heatproof oven dish. Lay the salmon fillets on top. 2. 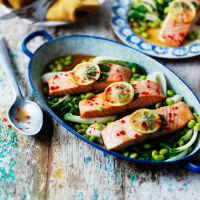 Cut four thin slices from the lemon and place one on top of each salmon fillet with a coriander sprig. 3. Mix together the juice from the remaining lemon, vegetable stock and soy sauce and pour into the dish. Scatter the fish with the chilli, then cover the dish tightly with foil and bake for 20-30 minutes until the fish is cooked through and the vegetables are tender. Drizzle very lightly with toasted sesame oil and serve.